• 55-3311 United States Army. Delivered 09-Nov-1956. Designated as U-1A. Jul-1957. Moved with the unit when it deployed to Illesheim, Germany. Nov-1959. 207th Aviation Company based at Heidelberg, Germany until Mar-1964 when it returned to the USA. May-1964. Army Aeronautical Depot Maintenance Center (ARADMAC) Depot, Corpus Christi, TX., where it was placed in storage. Jan-1967. Joined the Inter American Geodetic Survey (IAGS) in Panama. Apr-1968. Arrived at the Sharpe Army Depot, Stockton, CA., where it was prepared for shipment to Vietnam. Oct-1968. Attached to the 388th Transportation Company, where it was prepared for service in Vietnam. Feb-1969. 18th Aviation Company, Pleiku, Vietnam, for whom it flew until Feb-1971. Feb-1971. 388th Transportation Company, Vung Tau, Vietnam for storage. • 53311 Assumed serial. Handed over to the Government of Cambodia for the Khmer Air Force, Sep-1971. Destroyed during rocket attack on Pochentong airfield on 21-Mar-1972 and withdrawn from use. 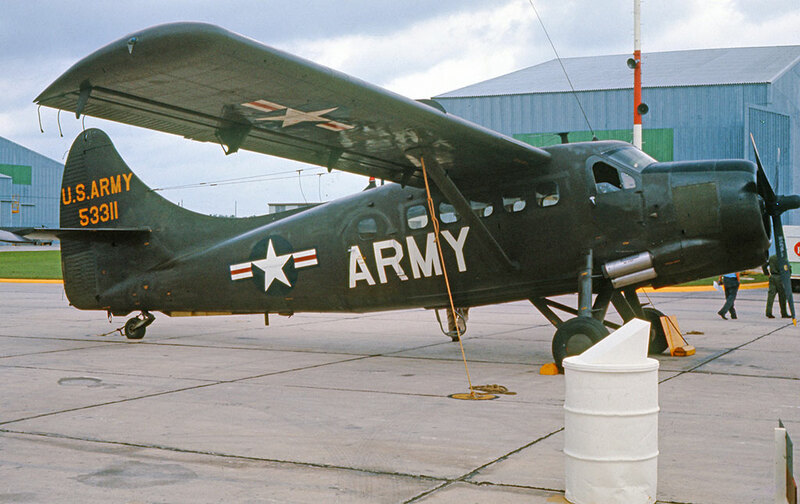 Otter 173 was delivered to the United States Army on 9th November 1956 with serial 55-3311 (tail number 53311). It first served with the 3rd Aviation Company, Fort Riley, Kansas and moved with the unit when it deployed to Germany in July 1957, establishing at Illesheim. The 3rd Aviation Company disbanded in November 1959 and 53311 then joined the 207th Aviation Company based at Heidelberg, Germany. The Otter's European deployment came to an end in March 1964, when it was transported back to the United States, arriving at the ARADMAC Depot, Corpus Christi, Texas in May 1964, where it was to remain in storage for some time. In January 1967 it joined the Inter American Geodetic Survey (IAGS) in Panama and in April 1968 arrived at the Sharpe Army Depot, Stockton, California where it was prepared for shipment to Vietnam. On arrival in Vietnam in October 1968 it was received by the 388th Transportation Company, where it was prepared for service. In February 1969 53311 joined the 18th Aviation Company, for whom it flew until February '71, when the 18th stood down. The Otter went back to the 388th Transportation Company, Vung Tau for storage and in September 1971 was handed over to the Government of Cambodia, one of 18 Otters transferred to that country. Their operation was short lived, and the fate of this Otter can only be recorded as “withdrawn from use and scrapped”.